KANSAS CITY, Mo. -- United Airlines says it's investigating after mistakenly flying a Kansas family's dog to Japan. CBS affiliate KCTV reports that Kara Swindle and her two children flew from Oregon to Kansas City, Missouri, Tuesday on a United flight. The family is in the process of moving from Oregon to Wichita, Kansas. According to CBS affiliate, KCTV, Kara Swindle was flying into Kansas City Tuesday night, accompanied by her two children and Irgo, the family's German shepherd. Or so they thought. 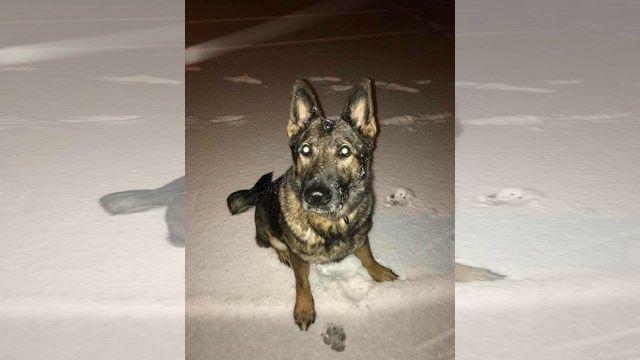 Upon landing in Kansas City, the family went to a cargo facility to pick up 10-year-old Irgo, a German shepherd, but were instead given a Great Dane. Swindle, of Wichita, Kansas, learned Irgo had been put on a flight to Japan, where the Great Dane was supposed to go. The airline said the kennels were similar. "I just want to know where my dog is," Swindle told KCTV. "The fact that we don't have any idea is the most frustrating part. He could be in Kansas City and we have no idea because the paperwork is all messed up. They have our paperwork here saying that this is the correct dog, but we know it's not. It's just horrible." According to KCTV, Irgo will see a veterinarian before being put back on a flight to Kansas City. There is a chance that Irgo may need to be quarantined for up to two weeks in Japan due to traveling on an international flight. It remains unclear as to when the dog will arrive in Kansas City. "At this point, all I can do is be hopeful that my dog is going to be OK and return safely," Swindle told KCTV. "I don't know what else to do at this point. I can't cry anymore. I've cried too much." "An error occurred during connections in Denver for two pets sent to the wrong destinations. We have notified our customers that their pets have arrived safely and will arrange to return the pets to them as soon as possible. We apologize for this mistake and are following up with the vendor kennel where they were kept overnight to understand what happened. "The news of Irgo's unplanned odyssey comes as United admits a dog died after a flight attendant forced it to travel in an overhead bin on a Houston-to-New York flight. The airline recently changed its pet policy, limiting what animals are allowed in the aircraft cabin. Small dogs inside a carrier that fit underneath the seat are typically allowed.